The many adjustments to income permitted by the tax code, plus alternative tax rates on the largest sources of income of the wealthy, explain why the average federal income tax rate on the 400 richest people in America was 18.11 percent in 2008, according to the Internal Revenue Service, down from 26.38 percent when these data were first calculated in 1992. . . The truth of the matter is that federal taxes in the United States are very low. There is no reason to believe that reducing them further will do anything to raise growth or reduce unemployment." The report concludes that "new legislation enacted since January 2001 has been responsible for two-thirds of the debt growth. In the new legislation, roughly three dollars of new spending has been enacted for every two dollars in tax cuts between 2001 and 2011. 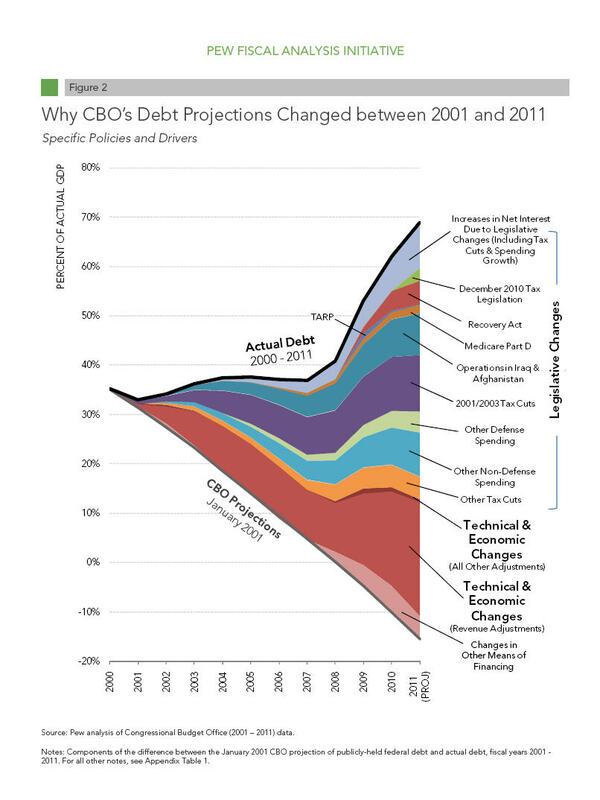 No single policy or piece of legislation, however, is overwhelmingly responsible for the $12.7 trillion shift in CBO’s debt projections for 2011 that occurred between January 2001 and March 2011." 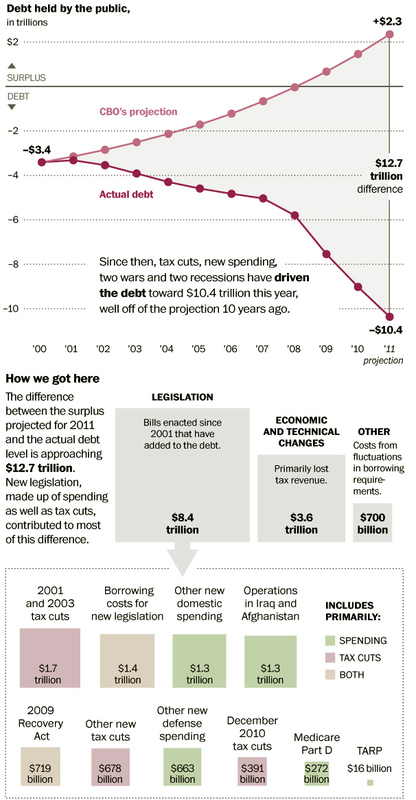 "The nation’s unnerving descent into debt began a decade ago with a choice, not a crisis." 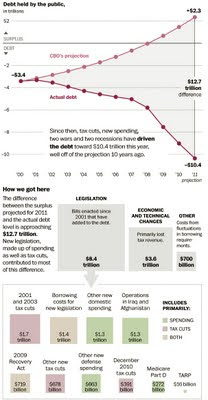 Read the Washington Post, Running in the red: How the U.S., on the road to surplus, detoured to massive debt, which includes the following graph and this note: "In 2000, the United States had $3.4 trillion in debt held by the public. 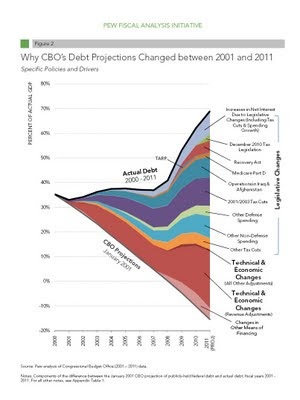 Based on policies in place at the time, the Congressional Budget Office projected in 2001 that the country could pay off its debt by the year 2008 and by 2011 have a $2.3 trillion surplus." UPDATE IV: Will it be Palin/Trump in 2012? Read NY1.com, Palin, Trump Have NYC Rendezvous. Would it be a dream or nightmare ticket? UPDATE III: "Having Donald Trump in the presidential race gave it the feel of a carnival . . . [and] showed us how truly scary our political system has become." Read the Washington Post, Donald Trump and the House of Horrors. UPDATE II: After milking it for all the publicity he could, he's quit. Read the Washington Post, Trump the clown exits stage right. UPDATE: More on America's celebrity obsession. Read The Atlantic, In 2012, Celebrity Trumps Substance. Republi-con qualifications for president -- charisma, significant personal wealth and near-universal name identification. But is it enough? Read the Washington Post, The Donald, debunked. UPDATE II: Just announced, "the formation of: 'Comedians for Sarah Palin.' [Their] slogan is: 'Comedians putting aside their differences and the good of America for comedic material.'" Read CNN, Support Palin! Put a comedian to work! UPDATE: In the latest Gallup poll, "Mitt Romney (17%) and Sarah Palin (15%) now lead a smaller field of potential Republican presidential candidates in rank-and-file Republicans' preferences for the party's 2012 nominee. Ron Paul, Newt Gingrich, and Herman Cain essentially tie for third, with Cain registering 8% support in his initial inclusion in Gallup "trial heat" polling. Notably, 22% of Republicans do not have a preference at this point." Read Gallup, Romney, Palin Lead Reduced GOP Field for 2012. In addition, Palin is "fortifying her small staff of advisers, buying a house in Arizona — where associates have said she could base a national campaign — and reviving her schedule of public appearances. The moves are the most concrete signals yet that Ms. Palin, the former governor of Alaska, is seriously weighing a Republican presidential bid." Read The New York Times, Signs Grow That Palin May Run. You may remember, that in July 2009 I predicted that Palin would "build her network for 2012 by campaigning and fund raising for other candidates" and "cash in with a book and some speeches, maybe a little paid commentary on not-the-FoxNews." And just in time, a "new film commissioned by Palin, the former governor of Alaska, will present her as a Joan of Arc-like figure beset at every turn by vicious leftwing enemies seeking to thwart her ambition of reviving the conservative legacy of Ronald Reagan." Read The Guardian, Sarah Palin likened to Joan of Arc in two-hour documentary film. Typical Republi-con, trying to advance their political careers on the the Reagan myth. With Mitt, Mike, Donald, and Newt flopping or quitting, "a whiny drama queen" gets a second chance. Read FITSNews, Sarah Palin Is Back. UPDATE II: It is your choice, "Government can keep its current promises, undertake the complicated and often frustrating work of bringing health costs under control, and work for the day when everyone has health insurance. Or it can ask individuals to carry an ever-heavier load, expect invisible hands to perform miracles and leave Americans to take their chances with the insurance companies." Read the Washington Post, Why Paul Ryan is losing the Medicare argument. UPDATE: For more on the public reaction to the Republi-con 'every man for himself' governing philosophy, read the Washington Post, Republicans continue to be their own worst enemy. As I stated before, the Naive-ocrats have been too stupid to call the bluff -- give the public what it claims it wants until they don't want it anymore. Because they really don't want what the Republi-cons propose. Read the Washington Post, Democrat Hochul wins N.Y. special House election and The New York Times, G.O.P. on the Defensive as Voters Resist Medicare Plan, which noted: "voters like the idea of budget cuts, but that they often recoil when those cuts threaten the programs that touch their lives."